Are you a WordPress website owner? Do you know how many people visit your website? Do you know how many new users visit your website? How many of them became your customers? Google Analytics can give you answers to all these questions, that is why every website owner should have it. Dimensions & Metrics. Dimensions are the attributes of your visitors (e.g. browser, session duration, etc. ), and Metrics are numbers measuring characteristics of dimensions (e.g. % of new sessions). Sessions. It is a time spent by users on the websites. In other words, it is a way to report about visits. Visitors. Here you can find how many unique and new visitors do you have. Bounce Rate. It is a percentage of single-page sessions. Pageviews. It is a total number of pages viewed by visitors. Pages/Visits. Show all pages viewed during the session. Goals. Allow you to gather info about specific actions completed by users (downloads, purchases, etc.). Firstly, it is necessary to create Google Analytics account and paste a unique tracking code from Google onto your website pages. When done, you can configure your account in accordance with your requirements. You can set own goals and choose the information you’d like to track. In a few hours, you’ll be able to check first data about your site. Google Analytics plugin allows you to manage statistical reports received from Google Analytics account right from your WordPress admin dashboard. 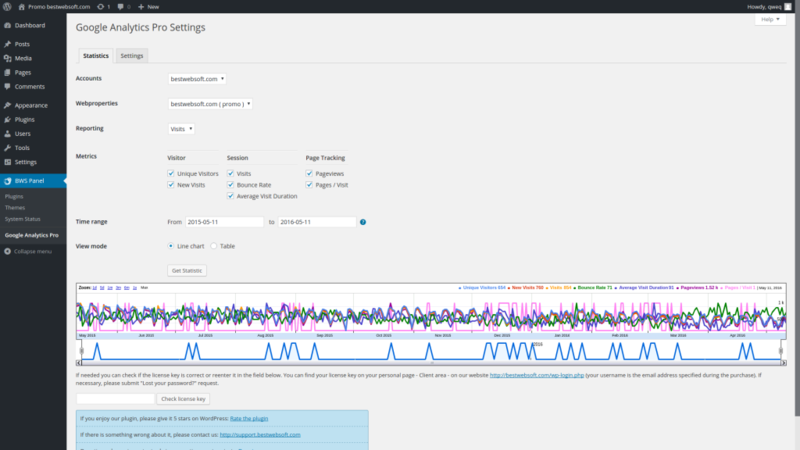 Reports appear as a line chart or table on the plugin settings page. Having all these data allows you to study your audience and its preferences, and this is an important factor if you’d like to make major gains. Install Google Analytics today and get an access to the information valuable for the successful development of your project!